We are well into December. It's time to take stock of your year and your accomplishments. It’s definitely time to have fun and to be mindful of what is ahead. As we turn the corner into a new year, 2015, today’s Women’s Wednesday you are invited to take a short, interactive quiz to evaluate where there is room to expand your dealership’s customer excellence. And in doing so, your competitive edge. The idea to establish a quick test came from a family of dealerships with extraordinarily high CSI and WSI (Women Satisfaction Index) scores. They asked Women-Drivers.com to establish a baseline to gauge how they compared to other dealerships in order to further increase customer loyalty and engagement for their business. We interviewed a number of other forward-thinking dealers in the following areas: Sales, Service, BDC, Brand Reputation, Concierge Services, Social Media, etc. There are always two sides to everything, right? To keep our car reviews innovative and well-rounded, we are providing you with not just one, but two points of view on the same exact vehicle – Her + His perspectives. Ever notice how narrow advertising messaging is from one dealership to another? According to most marketing messages, every dealership has the ‘best’ pricing. Truth is, not all dealerships offer the best customer service. 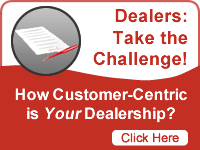 How come more dealers don’t advertise their customer excellence+service? A-HA! THAT’S what women+families are most interested in is having a trusting, respectful and comfortable experience! After completing the 12-question test, dealers are assessed and scored into one of four categories: Leading the Pack, Standing Tall, Holding Your Own and Missing the Mark. In this highly competitive industry, dealers are constantly looking for new ways to expand their level of customer service and retention. Some simple recommendations are provided upon completion of the quiz such as courtesy cars and a child-friendly area. These are not novel ideas, yet it is surprising how many dealerships have yet to embrace fairly effortless changes such as these. The quiz feedback also includes innovative initiatives in each of the four categories to stretch your customer service and standards to meet the changing landscape of the customer. What's your score? Want to Sell More Cars and Distinguish your Dealership to Women?